On January 15, 1919, a huge storage tank of molasses exploded without warning, and caused a wave of molasses and debris to travel down Commercial Street at 35 miles per hour. About twenty-one people were killed, and 150 people were injured. The value of all property destroyed was around $1,000,000 [or $12.4 million current dollars]. The tank was five stories high, and contained 2.3 million gallons of molasses. This event became known as the Boston Molasses Flood. Prohibition of alcohol consumption was being amended to the U.S. Constitution in 1919, and molasses is used in the manufacture of rum. Plans were made by the tank owners to convert their East Cambridge plant from the production of rum over to (still legal) industrial alcohol. A final batch of molasses for rum production arrived in November 1918—the ill-fated shipment. The tank had been hastily constructed 3 years earlier, and proper design and construction standards were not followed (rivet strength was not checked as an example). 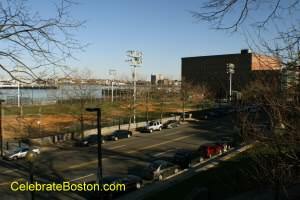 The Boston Molasses Flood was historic for several reasons. 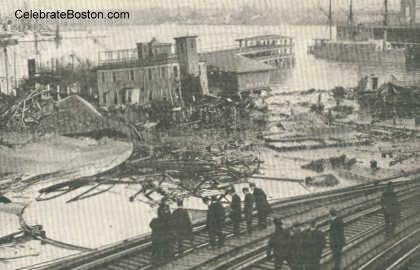 The flood was tragic because many innocent people were killed, including a Boston firefighter who slowly drowned in the molasses, having been trapped in the debris in a nearby damaged firehouse. A class action lawsuit was filed, and $628,000 was eventually awarded to the victims, a large sum at that time. It was unusual for such suits to be successful back then. The tank's owner had claimed an anarchist had blown it up, which was rejected. The January 17, 1919 Boston Globe describes the initial investigation into the cause of the tank collapse: "The lack of evidence of an [explosive device] or the expansion of the lower stratas of the molasses has led the investigators to believe that the damage done to the Elevated structure on Commercial st was what would naturally be expected when a section of the steel tank weighing tons was swept against the upright pillars, designed to sustain an enormous weight, but not intended to sustain a great lateral pressure. The collapse of two houses on Commercial st, both wooden structures, is explained on the theory that when the sea of molasses flooded across the street with a rush, slapping against the stone wall of the Copps Hill section of North End Park to a height of 15 feet, the cellars were flooded and the receding tide of molasses carried the buildings off their foundations and caused them to collapse. The 'high water mark' of the molasses is easily discernable upon the stone walls and steps of the park." Some of the good results of the Boston Molasses Flood were improved engineering safety standards, such as the use of stamp plans (documenting changes during construction), architects authorizing all work, and more observation during the construction process.